Okay, who’s the smart one who brought an umbrella? Because I know it’s not me. No, when the sky cracks up and the rain smacks down, I’m the one wearing heavy jeans and a thick, spongy sweater that soaks up everything and turns me into swampy slab of peat bog. Yes, I’m drenched, I’m dripping, I’m ice-chilled to the bone. This can get tricky for me and the mrs… Due to a pretty large height disparity, umbrella sharing leads to some tricky situations. Usually I carry the umbrella, but that leaves its protective shell a good several feet above her head, leaving her almost as unprotected as if you tried to shelter an ant in a hurricane using just a nickel from 6 feet. If we let her carry the umbrella? I get a fistful of hair caught in the wire spokey-dokes of the umbrella trap. Ouch. This ended up being such a problem in rainy NYC, that we had to move to sunny SD to avoid dealing with umbrellas all together. AWESOME. I wish someone I was with this evening (myself included) had remembered to bring an umbrella, as the season of the regular afternoon thunderstorms is in full force already. 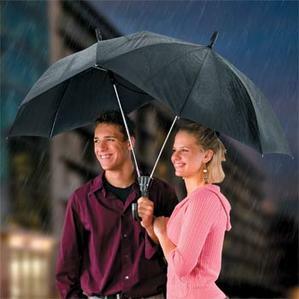 What is awesome though: when the person holding the umbrella is an expert umbrella holder–he/she understands that a little above both of your heads is the perfect height so it won’t drip all over your backs, and he/she does not complain when his/her arms get tired. So freaky, I was walking to work yesterday and it was raining and I snuck under someone’s umbrella as they were walking along – and I thought “hey this would be the perfect thing to put on 1000awesomethings” but then I thought “oh, but how often does this happen? nobody would be able to relate to it…” and then today I see this! umbrellas are for the weak. get a raincoat. Raincoats are for the dorky. Just stay out of the rain. Or, you know, you could always go for one of these. I’ve got one for you. The very first time you fart infront of your new boyfriend/girlfriend. That’s an awesome feeling!!!!! This is good when people have those bigger umbrellas. The biggest fight my husband and I ever got into was over sharing an umbrella. It was awful. I may share a bed with that man, but I’ll never share another umbrella with him again. That’s interesting…I’ve had a similar problem with my wife and her selfish refusal to share her umbrella with me. Are you able to share details of the fight or is it too personal/embarassing? this blog is so cute! congratulations…. I came from The Star article. Good job, they even included your hyperlink! Oh, and on topic, I’ve saved strangers from the rain before. It’s uncommon to carry an umbrella in Saskatchewan, but I once had 8 people under mine at a bus stop without a shelter, in a downpour. Similar to Freddo above, my body type causes all kinds of issues when this happens. I know what your thinking – thats too bad. But it’s all good! As opposed to tall I am a little more robust shall we say and as a result when I am offered an umbrella it is usually a lovely lady that has to LEAN into it to keep us both covered. Since I only hang out with lovely ladies it truly is AWESOME! Pingback: Abandoned Stuff by Saskboy :: Do You Hog Your Umbrella? I am always the person that remembers to bring an umbrella! And people always scoot on under it. It’s ok though, people are always so happy when they realise I have an umbrella and there is room for them. Did this today! Thank God for my smart friends! I was once under my umbrella in the rain, feeling a bit harassed by the weather, walking fast as Londoners do. A man who was slightly drunk came up to me and ducked under my umbrella. I felt instant outrage, ‘How Dare he!’ … but he turned out to be friendly. In fact, while chatting with him my mood switched rapidly; by the time he went of to a pub my mood was relaxed and happy. The rain was no longer my enemy. I have the height problem with my BF too. When I’m feeling mean I manhandle the umbrella away from him and just hope he doesn’t hit his head too hard. Does it count if you literally sneak up behind someone and stay under their umbrella from behind without them knowing? I don’t mind sharing an umbrella with a nice lady. Your insite on this issue is very captivating and I hope to see more posts on your blog about it. I have bookmarked http://1000awesomethings.com/2009/05/12/768-sneaking-under-someone-elses-umbrella/ so I can not miss out on any future posts similar to this subject. Took me a while to read all the comments, but I really loved the write-up. It proved to become Pretty useful to me and I am positive to all the commenters here Its always great when you can not only be informed, but also entertained Im certain you had fun writing this post. the best is when someone walking down the street just happens to have an oversize umbrella, and you can walk behind them under it without them even knowing, HA!